A bathroom can be nothing more than a profoundly functional room, a place to perform the necessary ablutions and nothing more, decked out in plain white tile and porcelain. Which is fine, of course, but where's the fun in that? 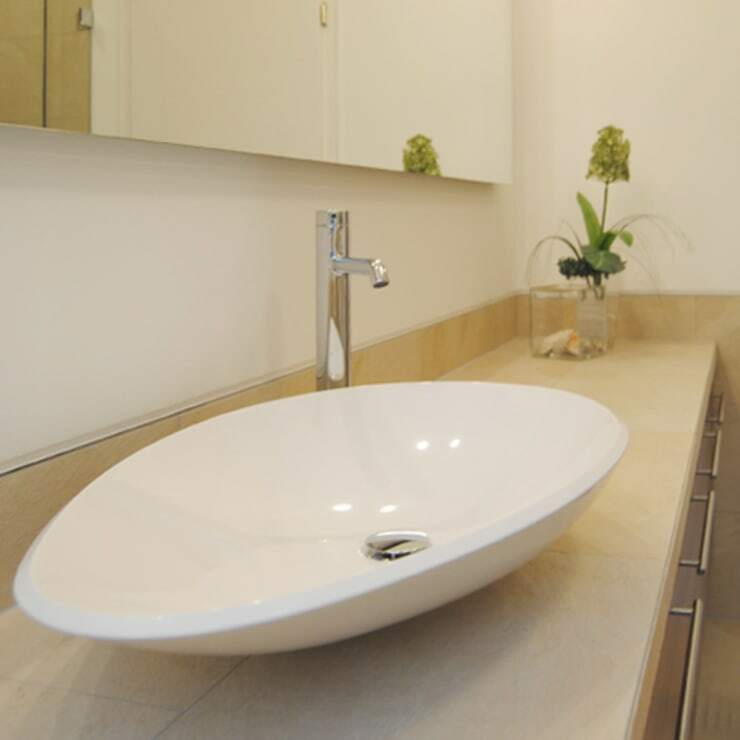 As a centrepiece of sorts to the room, and a place where you'll spend a good deal of time, your sink is an opportunity to inject a little style and beauty into both your bathroom and your daily routine. White porcelain bowls are fine as they go, but there are a multitude of other choices out there, from rough hewn stone, to moulded concrete to wood; and in a plethora of shapes from sleek to jagged. 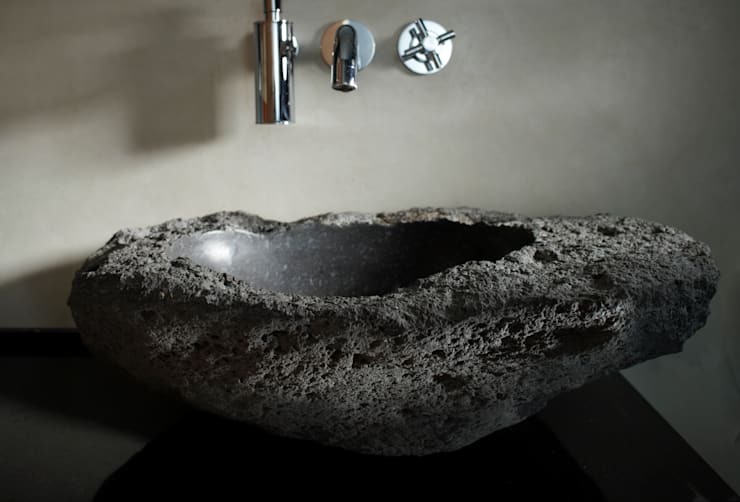 This gorgeous natural stone sink from Ströhmann is heavy (pun intended) in the wow factor. Its polished smooth interior contrasts powerfully with the rough, pock-marked exterior, and brings to mind coral or pumice. If you've kept your bathroom simple and plain, but want one piece that screams 'Look at me!' while still blending in, this could be a great option. The sink's neutral grey will fit with all manner of colour schemes, while its striking form factor does all of the talking for it. 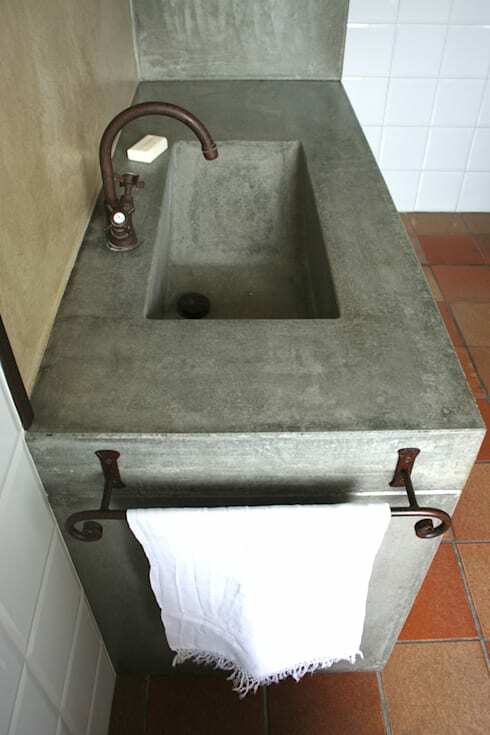 Be inspired by this project from StudioAfa, which combines ultra-modern poured and smoothed concrete, with a rustic finish on the surface, as well as rustic fittings, in the form of a wrought-metal towel rail and traditional faucet. Mixing and matching styles can reap huge style rewards, creating remarkable and unusual pieces—like this sink unit! Past and present combine in Bath Table 2014 by Fabio Crimi Design. A classic white porcelain sink is given an update with an ash and MDF frame whose light colours and clean structure give a very modern feel to a traditional shape. 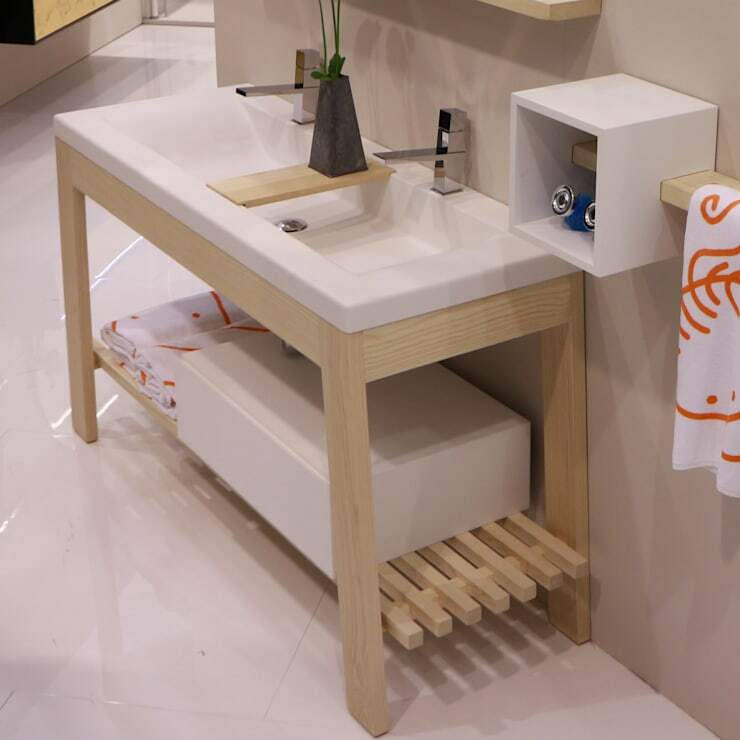 Useful storage space underneath, and a neat cross shelf, make this sink practical as well as stylish. A combination of vintage with a touch of exotica: who could say no? The marble basin sitting atop this cabinet evokes the sink's genesis as a combination of, you guessed it, basin and jug, while the square lattice-work of the cabinet has evokes the furniture design traditions of parts of Asia. 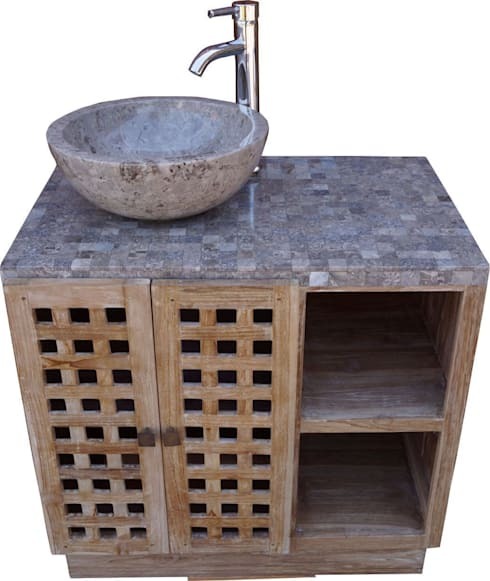 A slightly shabby chic finish on the wood stands in nice contrast to the smoothed marble of the countertop and sink. Find faucets a little bit… recherché? Hide them! As you can see in the next image, the sleek minimalism of this sink by Edoné is leavened by the warm, rich wooden cabinet that holds it. Better yet, the entire cabinet floats, adding another touch of modern minimal to this fabulous piece. We may have been a little hard on white porcelain in the introduction, and this elegant and refined piece from Fürst Architects puts us in our place. Perfect form and design create a seriously chic piece, a far cry from the mass-produced porcelain basins that bring function, but no beauty, into a bathroom. 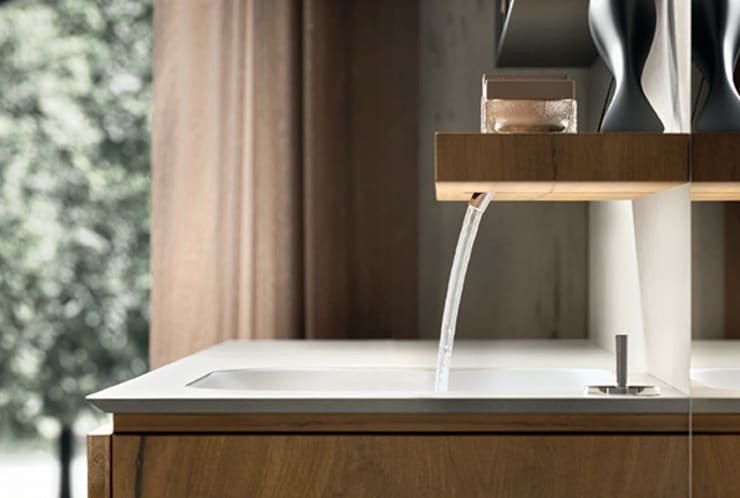 For many, wood would not be the first material that comes to mind when thinking of sink design. 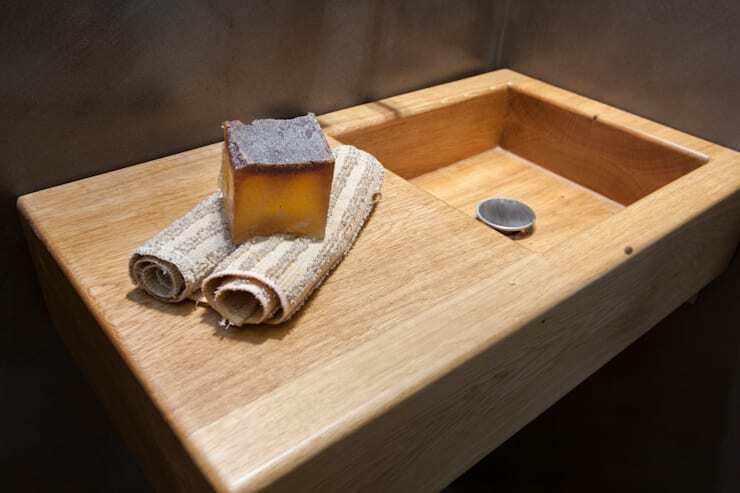 However, treated wood has kept many a ship afloat through the centuries—why should it be any different when it comes to sinks? Wood like teak has natural waterproofing properties—it has been used for hundreds of years in the shipbuilding industry for this reason; it also has natural antiseptic properties, which is a bonus for use the bathroom. Other woods can be treated for use in building sinks and baths. Wood gives a gorgeous softness to any bathroom, and as a bonus, its superior insulating properties—relative to porcelain or steel—will keep water warmer longer.